61. The Perlina School is an independent, private Jewish day school currently operating at close to capacity with 120 youngsters in preschool and grades one through seven. (Capacity is 124 pupils.) Perlina receives no government aid, but charges $600 monthly per pupil, said Rabbi Yonatan and Mrs. Ina Markovich, the Israeli couple who established and direct the school. The tuition fee is typical for good private schools in Kyiv, the Markoviches said, but only about one-third of Perlina pupils come from families who pay the full fee. Scholarships for the others are provided through fundraising. Unfortunately, said Mrs. Markovich, economic distress has forced some formerly tuition-paying families to request scholarship assistance; some of these families are embarrassed by, and even ashamed of, the situations in which they now find themselves. All pupils are at least partially Jewish, but not all are halachically Jewish, Mrs. Marko-vich stated. Perlina students presented an Eng-lish-language puppet show with hand puppets from behind the blue curtain, reaching over it for the performance. They later received audience ap-plause in front of the curtain. The major appeal of the school to parents, stated the Markoviches, is small classes (no more than 15 pupils in a class) and a strong emphasis on acquisition of English-language skills, as well as a rigorous overall general studies curriculum. Youngsters are scheduled for 10 classes of English weekly, all taught by native English speakers. Additionally, they have five weekly classes in Hebrew and three in Jewish tradition. Pupils also participate in an abridged version of traditional morning prayers every day and a kabbalat Shabbat (welcoming the Sabbath) observance every Friday afternoon. 62. The writer was unable to visit the Mitzvah school, a small school that probably enrolls fewer than 100 children in preschool and elementary grades. Mitzvah operates under the auspices of Chabad Rabbi Moshe Reuven Asman. 63. 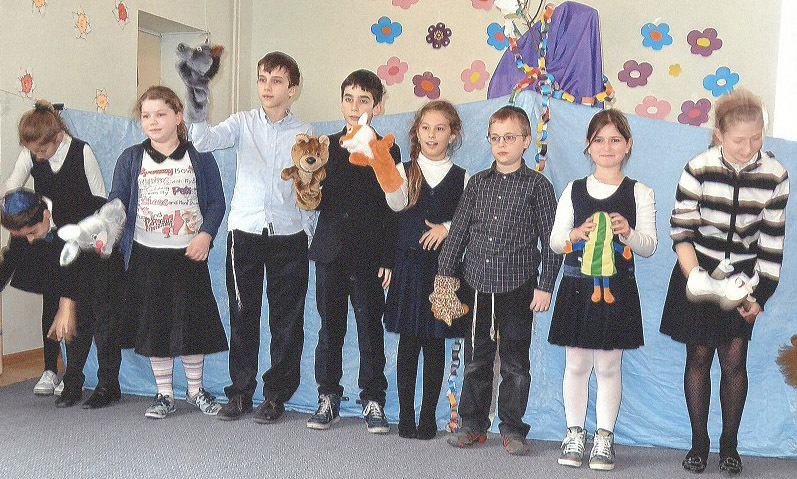 Rabbi Yonatan and Mrs. Ina Markovich, who operate the Perlina school, opened a school for autistic children in Kyiv in 2010. Known as Дитина з майбутнім (Ukr. ; Children with a Future), the school is housed in a renovated two-story building previously used as a preschool. Enrollment at the school now stands at 32 youngsters between the ages of two and seven, which is full capacity for the current building. The teacher:pupil ratio is 1:1, not including speech therapists, psychologists, and other specialists. Due to the large number of educators and other skilled professionals required for schools of this type, the monthly tuition is $2,000, more than twice the cost of a good private school for normal youngsters. All families pay something, stated Mrs. Markovich, but the majority receives substantial support from a scholarship fund. However, she continued, available funds are insufficient to cover tuition for all pupils and, regrettably, five youngsters left the program when their families were unable to pay a reasonable share of its costs. A major problem, she continued, is that most families are single-parent families because the father simply walks out when faced with the reality of his child's issues; thus, the family draws on only one income, and that only if the mother is able to work. A teacher helps two autistic pupils with lunch. Mrs. Markovich said that the school is fortunate to have attracted two men to teaching positions in a field dominated by women. 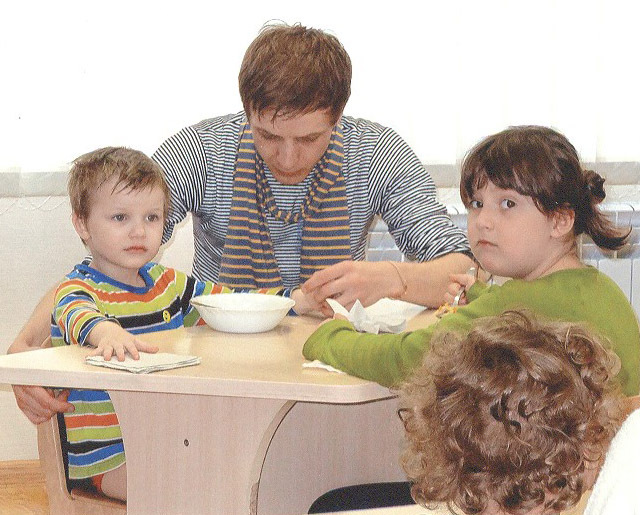 (It is likely that the Marko-vich school offers the best conditions in Kyiv for teachers of autistic children.) Note the teacher's scarf in Ukrainian national colors. Notwithstanding the financial commitment required of all families, the school has a long waiting list. It has achieved a good reputation in its three years of operation, Mrs. Markovich said, even managing to prepare some youngsters for successful entry into regular, conventional schools. A related issue is the development of a continuing program for youngsters above the age seven who cannot attend regular schools. The process of establishing such a school is bureaucratically difficult, Mrs. Markovich stated, because no precedents for it exist. No Ukrainian curriculum has been prepared for this type of school, she continued, so curricula from other countries would have to be translated, studied, and adapted to Ukrainian reality. Further, she noted, few govern-ment ministries are functioning during the current political situation. Heads of ministries have simply left their posts and gone home. Confusion reigns among staff who still come to work and, clearly, no one has authority to make decisions. Other problems include a lack of understanding in the broader community about autism and a conflict between the Ministry of Education and the Ministry of Health about which ministry controls autism-related proposals and programs. Mrs. Markovich and some of the more articulate parents of autistic children have mobilized a group of volunteers who provide information to interested people in the Ministry of Health and to the interested public; they also lobby the Ministry of Education to establish special classes for autistic youngsters. However, the Ministry of Education provides no funding for the preparation of teachers equipped with skills to work with autistic children; a few pedagogical institutions offer such programs on their own initiative, but these programs receive no financial support from the state and usually are poorly organized and shallow in content. Mrs. Markovich and her associates have approached several foreign embassies and foundations for support in promoting public awareness of autism, but, technically, they represent no one but themselves. They have no formal organization, no office or telephones; a friend is providing modest office space and a part-time secretary, but they need a much more substantial infrastructure to achieve their goals. Working with parents of autistic children is another area that requires a great deal of attention, Mrs. Markovich stated. Few pediatricians have been educated to recognize signs of autism in early childhood. Children are enrolled in regular preschools or schools, where they immediately are labeled as problem children and usually expelled. Frequently, parents deny that any real issues exist and blame the teacher or school principal for incompetence; they feel that they are being blamed as deficient parents and become belligerent, vigorously denying that they use drugs (when no one has accused them of using drugs). They are not "losers," they say, and their children are not losers either. Such parents expect the Markovich school to "cure" their children since they are paying tuition. They decline to work with their children at home, refusing to follow instructions issued by the school to reinforce skills taught there. For example, the school succeeds in teaching a child how to tie his shoes and then informs the parents of this achieve-ment; the parents are asked to follow up at home, encouraging the youngster to tie his shoes as he gets dressed. However, Mrs. Markovich stated, many parents continue to tie the child's shoes for him, claiming that it is "easier" that way. Some parents say that the school should not tell them how to raise their children. To address these problems of parental denial, frustration, and aggression, the school will begin a new program for parents in September 2014. First, said Mrs. Markovich, all parents will be required to sign a contract that states, among other things, that they will follow protocols of the school at home. Second, Mrs. Markovich continued, the school will organize some compulsory classes/gatherings for parents in which these feelings of denial, frustration, and aggression can be discussed and confronted in a productive manner. Obviously, such sessions can be used for counseling and socialization as well. 64. Iosif "Iosik" Akselrud is the Director of Hillel CASE, the section of the Hillel student organization that oversees Hillel operations in Ukraine, Belarus, Moldova, Georgia Azer-baidzhan, and Uzbekistan. He is less concerned with specific Hillel programs in Kyiv, he said, than with overall management issues. Known as an excellent fundraiser, Mr. Akselrud said that it is impossible to raise money in Ukraine this year. Political and economic instability simply deter people from contributing. Approximately 55 percent of the Hillel CASE budget is provided by U.S.-based sources, principally Hillel International and the Schusterman Family Foundation, Mr. Akselrud stated. He is responsible for raising another $595,000 within the CASE area and spends about 80 percent of his time in pursuit of these funds. The Genesis Philanthropy Group of Moscow is a dependable major donor, Mr. Akselrud said, but he still must find $360,000 and doubts that he will be successful. Budget cuts will be necessary. The current inflation rate of about 30 percent just exacerbates an already difficult situation. Iosif Akselrud oversees Hillel operations across a broad swath of former Soviet territory, from European territories through the Caucasus mountain area and into Central Asia. Referring to the Maidan demonstrations, Mr. Akselrud said that many Hillel activists were active in the protests as "strong, proud Ukrainians." Of those who were unable to participate, many called Hillel with questions and/or just needed to talk with someone. Many Hillel students also met in an impromptu manner, gaining support in a turbulent time from being together in a comfortable Jewish setting. However, violence in the streets caused Hillel organizations in both Kyiv and Lviv to cancel their activities and close their offices for several days. He has been in contact with the Crimean Hillel groups in both Simferopol and Sevas-topol, stated Mr. Akselrud. Hillel members have come together for mutual support in these cities as well, he said. They do not want Crimea to be part of Russia. The immediate reality of Russian control over Crimea, he continued, is that Hillel can no longer transfer funds to Crimean Hillel through conventional Ukrainian channels. Obviously, Hillel in Crimea is in particular need of financial assistance at this time, but the organization will have to create other means of transferring funds and reaching these groups in general. Hillel had scheduled a September 2014 Shabbaton at a conference center outside Moscow in celebration of the 20th year of Hillel operation in the post-Soviet states, Mr. Akselrud related. Two-hundred people from all post-Soviet Hillels were expected, he said. However, the conference will not take place, he continued, because Ukrainian Hillel activists have declared en masse that they do not want to "celebrate" anything in Russia and, therefore, they will not attend such an event. Their Russian counterparts say that they understand. Perhaps, the celebration will be transferred to Israel, Mr. Akselrud speculated, but substantial fundraising will be necessary if this is the case. Mr. Akselrud noted that a number of Hillel and other Jewish seminars/conferences had been scheduled for Crimean resort areas, but these will have to be re-scheduled for other venues. Reorganization will be very disruptive and probably costly as well. Notwithstanding all of the current difficulties, Mr. Akselrud continued, it is important to remember Hillel's many achievements. One of these, stated Mr. Akselrud, is Hillel University, a four-stage leadership development program that is intended to generate Hillel directors, Jewish-studies educators, and madrichim (leaders) for various situa-tions. Working closely with the Buncher Leadership Program of the Joint Distribution Committee, Hillel University prepares candidates through courses and seminars in management and Jewish studies. One aspect of practical training in this program is the management of JDC family camps by Hillel students. A survey has recently been completed that points to another achievement of Hillel, said Mr. Akselrud. Hillel, he stated, claims credit for 243 Jewish weddings that have occurred between couples who met through Hillel in Ukraine, Belarus, or Moldova over a recent five-year period. The CASE Hillel Board that Mr. Akselrud created continues to meet and to raise money. The lead donor on the Board, a Hillel alumnus, contributes $12,000 annually, Mr. Akselrud said, but it will be many years before Hillel can cover its expenses from money raised solely in the post-Soviet states. Oligarch Vadym Rabynovych continues his significant support, Mr. Akselrud continued. 65. The Ukrainian Union of Jewish Students, which is affiliated with the World Union of Jewish Students (WUJS), began to work in Ukraine in the 1990's, but suspended its activities after several years. It has since renewed operations in Ukraine under the volunteer leadership of Victoria Godik, who is employed professionally as an instructor in engineering management at a local university. Officially, Ms. Godik is Chairperson of UUJS, as well as a Vice President of the European Union of Jewish Students. WUJS/UUJS aims to "provide a community for Jewish young adults and young professionals," Ms. Godik declared. About 300 young Jews participate in UUJS activities in Kyiv, she stated, led by a group of approximately ten activists. UUJS cooperates with WUJS groups in other countries, such as the Baltic states, in planning weekend seminars and other activities. However, Ms. Godik noted, it has been "very difficult to concentrate this year" due to the conflict with Russia and the troubled Ukrainian economy. Almost all younger Jews in Ukraine support full Ukrainian sovereignty and are opposed to Russian intervention in Ukraine, Ms. Godik said. Some older Jews in Ukraine may be pro-Russian because they are nostalgic for the superpower Soviet Union and/or believe that their pensions would increase under Russian rule, but these older people are living in the past, she claimed. Both younger and middle-age Jews were out on Maidan in full force, stated Ms. Godik; Jews were among the leaders as volunteer medics and were prominent in the "I.T. tent" (information technology center). Jews also led "social initiatives," such as food preparation, on Maidan. 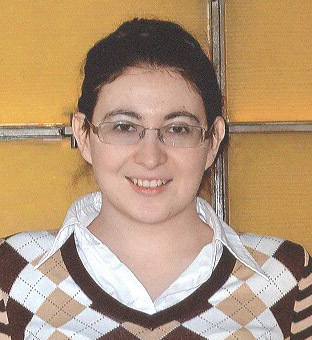 Victoria Godik is the volunteer leader of the Ukrainian Union of Jewish Students. She speaks fluent idiomatic English. Perlina uses an English-as-a-Second-Language program developed by Cambridge University. Its pupils take examinations developed for this course.